In the summer of 2004 all Koreans, no matter the age or gender, were glued to their television sets every weekend waiting to see what would happen next in 'Lovers in Paris.' This TV miniseries/drama successfully portrayed a modern Cinderella story, with Park Shin-yang and Kim Jeong-eun as the lead characters. Tae-yeong ends up returning to Seoul, and soon after, Gi-ju and Su-hyeok also return to Seoul separately. Tae-yeong asks Gi-ju for a job and in time, the two fall in love. Gi-ju’s father tries to force his son to marry Mun Yun-a (the daughter of an influential politician), and she exhausts every means to make this happen. As a family secret involving Gi-ju and Su-hyeok is disclosed, the relationship between Tae-yeong and Gi-ju is in crisis. He is the chairperson of GD Motors and is 31 years old. Raised as the head of a major company, he believes that there is nothing thing that he can’t do. His sense of humor and noble looks make him desirable to wormen. However, being divorced once and now pressured by his father to marry a woman he doesn’t love, Gi-ju is unsure about love. That was until Tae-young came into his life and charmed him with the warmth of her heart and free spirit. At times, Gi-ju can be arrogant and tends to do what he pleases, yet you can’t dislike him. At age 26, Gang Tae-yeong can’t bear injustice. Even though she gets into trouble every time, she can’t stop herself from speaking out. Her tough exterior would lead others to believe that she’s not that sensitive, but in fact, she has shed many tears. While economically she’s not that well off, she’s always thankful for what she has. She is saucy and cute, and her charisma attracts both Gi-ju and Su-hyeok at the same time. Yun Su-hyeok is 26 years old and takes to his uncle, Han Gi-ju who takes better care of Su-hyeok than Su-hyeok’s own mother does. It is after following his uncle to Paris that he ends up meeting and falling for Tae-yeong. He rejects the wealth that he was born into, and actively pursues Tae- young. Unfortunately, Tae-yeong’s heart belongs to Su-hyeok's uncle. Jealous, Su-hyoek makes things difficult for Tae-yeong and Gi-ju. At age 26, Mun Yun-a is the daughter of an influential politician. She is an indiscreet young woman who believes that money can buy love. She looks upon loving Gi-ju as a job and is determined to make him her husband. After learning that Gi-ju actually loves Tae-young, Yun-a tries everything to split them up. She is also an old friend of Tae-yeong. Including the scenes shot in Paris, France, there were also many unforgettable scenes filmed in Korea. Fans of the show will enjoy learning more about the many filming locations in Seoul. Located in front of Namsan Botanical Gardens, this is where Tae-yeong and Gi-ju throw a coin into the fountain before getting engaged, and Tae-yeong says, “Let’s just love!” Those that want to toss a coin in the fountain and wish for love can do it anytime with Namsan Fountain open 365 days a year. Tae-yeong’s roof-top apartment looks over all of downtown Seoul and is located just behind Naksan Park. The yellow paint will make it easy to spot. At Naksan Park, there is a bench where Tae-yeong and Gi-ju used to sit and talk. The Oakwood Premier can be seen in the first and second episodes as Han Gi-ju’s home in Paris. This lavish penthouse is on the 27th floor equipped with a private elevator. Gang Tae-yeong works here as a housekeeper, keeping the spacious home clean. Her little notes on the bathtub and refrigerator make her character seem even cuter. The coffee shop on the first floor of the hotel also became well known after the hit TV miniseries, 'Winter Sonata,' filmed some scenes here. Located in the heart of Seoul, this hotel is always bustling with people, be sure to make a reservation in advance if you are thinking of staying here. Location: Oakwood Premier COEX CENTER, 159 Samseong- dong, Gangnam-gu, Seoul. How to get there: From Seoul subway line 2 Samseong Station, go out exit No. 5 or 6 and walk for 3 minutes. When coming from the airport, take a limousine bus. The romantic swimming pool scene, the kiss between Tae-yeon and Gi-ju in the lobby, the sweet song Gi-ju sings for Tae-yeong at the bar, the college hockey party held at J.J. Mahoney's and the unforgettable engagement ceremony at the grand ballroom were all filmed at the Grand Hyatt. The Grand Hyatt Seoul hotel is located on Mt. 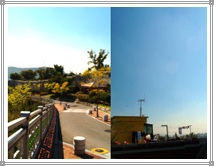 Namsan, with panoramic views of Seoul and the Hangang River. This five-star hotel boasts 602 rooms and a variety of facilities. The outdoor pool is turned into an ice rink in the wintertime and becomes a popular location for dating. How to get there: From Seoul subway line 6, get off at Noksapyeong station and go out exit No. 1. From here it is a five-minute taxi ride to the hotel. The multiplex cinema CGV is the model of CSV where Gi-ju’s ex-wilfe Baek Seung Kyeong works. With its 24 domestic branches, the multiplex cinema CGV is a joint stock company of Korea’ s CJ company, Hong Kong’s Golden Harvest, and Australia’s Village Roadsow. This is where Tae Yeong works for a while, and has a pajama party and dates with Gi-ju. At the Golden Class here, you are served by staff and can use the private lounge and bar. Just like the first class section of a plane, there are only 30 seats at the Golden Class. Located at World Cup Stadium in Sangam, you can also visit World Cup Park. With a ground level and underground ice rink, Mokdong Ice Rink was where Su-hyeok and Gi-ju enjoyed playing ice hockey. This is also the place where Su-hyeok confesses his love for Tae- yeong. The underground ice rink is usually used for ice hockey, while the ground level rink is used for ice skating. 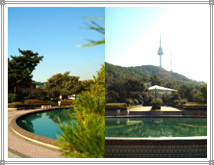 Itaewon Land, Jjimjilbang (Korean Sauna)– Click here to read a related article! During Gi-ju’s first visit to a jjimjilbang (Korean sauna), he unknowingly makes a comical mistake causing Su-hyeok and Tae-yeong to break into laughter. This five-story building contains various types of saunas, including a bul hanjeungmak (hot room), salt room, ice room, charcoal room and more. In addition to the saunas, this facility also has a DVD theater, PC room, comic book room, health room, and coffee shop, which make it a great place for relaxation and entertainment. How to get there: From Seoul subway line 6, get off at Itaewon Station and go out exit No. 3. Approximately 15-minute walk. For Tae-yeong, who works overtime, Gi-ju buys the shop. 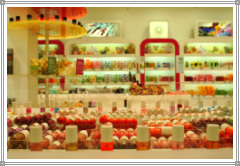 VOV is well known for its popular and affordable line of cosmetics. Average prices run from 3,300 ~4,300 won for products. How to get there: At Dongdaemun Stadium Station, go out exit No. 14. Go straight for about 100 meters. Store is located next to APM. * The pictures above are provided by SBS.